Arsenal striker Robin van Persie has been named the Professional Footballers' Association Player of the Year. The 28-year-old Holland international has scored 27 Barclays Premier League goals this season for the Gunners, his most fruitful campaign for the club, and was humbled to be recognised by his peers. 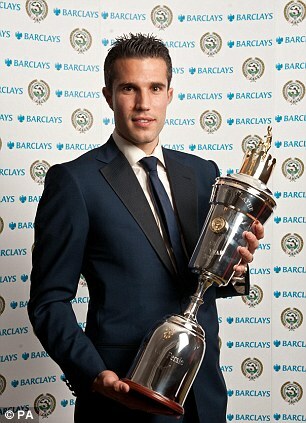 Van Persie may have picked up the top individual honour but he was quick to point out it would not have been possible without his Arsenal team-mates. Van Persie was utilised mainly as a second striker, and occasionally out on the wing, in the early stages of his Gunners career after being signed by manager Arsene Wenger from Feyenoord in 2004. But he has flourished since switching to the centre-forward role - despite initially not having been convinced he could make the transition.